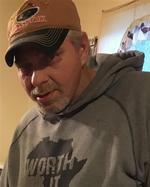 John Lester Owens, 47, of Canada, KY. passed away September 6, 2018 at the Pikeville Medical Center. He was born November 2, 1970 to the late Roy “Bunk” and Jeanette Varney Owens in Williamson, WV. Besides his parents John was preceded in death by one Son: Greyson Owens. He is survived by his loving wife: Brittany Ann Owens; two sons: John Eric (Haven) Owens and Peyton Roy Allen Owens both of Canada, KY; one granddaughter: Brooklyn Eileen Owens; one sister: Royetta (Robert) Parks of Canada, KY; one sister-in-law: Melissa Ratliff; one mother-in-law: Debbie Lowe; two nephews: Joseph DeWayne Parks and Devin Baker and host of other Special Family & Friends. John will be forever loved and missed by all that knew and treasured him. Visitation will begin at 1:00PM Saturday, September 8, 2018 at the Island Creek Freewill Baptist Church, Pikeville, KY and also Sunday, September 9, 2018 with nightly services beginning at 7:00PM. Funeral Services for John will be held Monday, September 10, 2018 at the Island Creek Freewill Baptist Church at 12:00PM with Frankie Bryant and Johnny Bryant officiating. Burial will follow in the Varney Branch Cemetery at Kimper, KY.
To send flowers to the family of John Lester Owens, please visit our Heartfelt Sympathies Store.